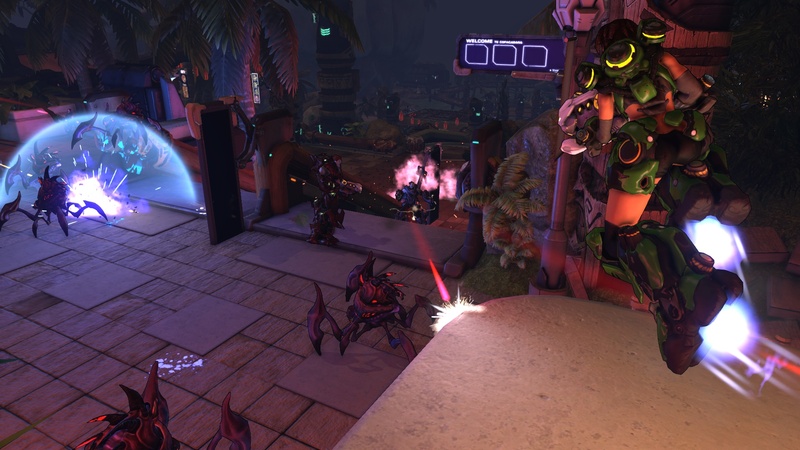 Firefall delivers unique free to play MMOFPS gameplay. After pulling the curtains off the title last PAX Prime, Red 5 Studios finally let gamers get their hands on Firefall at PAX Prime today. The goal is to offer a fully-featured MMO using modern shooter mechanics like class loadouts with a free to play business model. 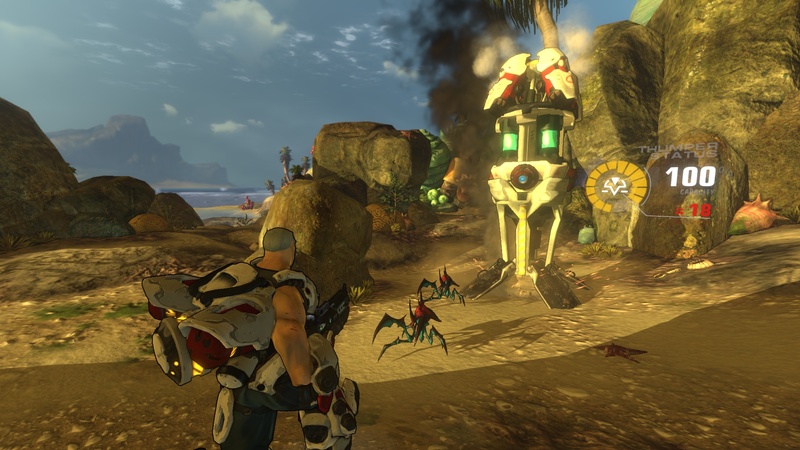 As CEO Mark Kern promised, Firefall isn't some cheapass fly-by-night free to play P.O.S. I found the environments, enemies and models all spectacular, and the open world, instanced PvP, questing, economic and army (read: guilds) systems as described by executive producer James Macauley sound intriguing. When Firefall launches as planned this December, the gaming industry will finally see if giving away a high production value MMO coupled with microtranscations can be as lucrative as monthly fees. 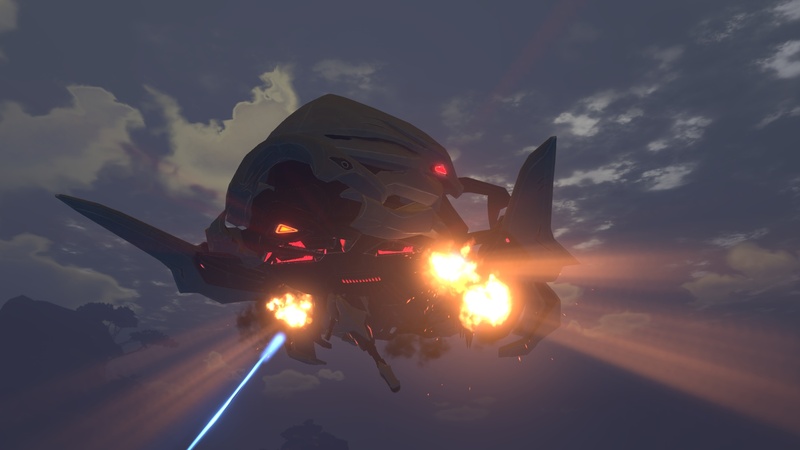 And if you don't care about all that money talk, I can at least say that Firefall is a blast to play. "We're super excited about changing up the way you think about free to play," Macauley said. "We're going big. We're revolutionizing what free to play means. We're offering a AAA world-class game to the market absolutely free. There will be no DLC, you won't have to pay to play on a map that your friend is on." Macauley believes that the number one reason people play MMOs is because their friends are playing. 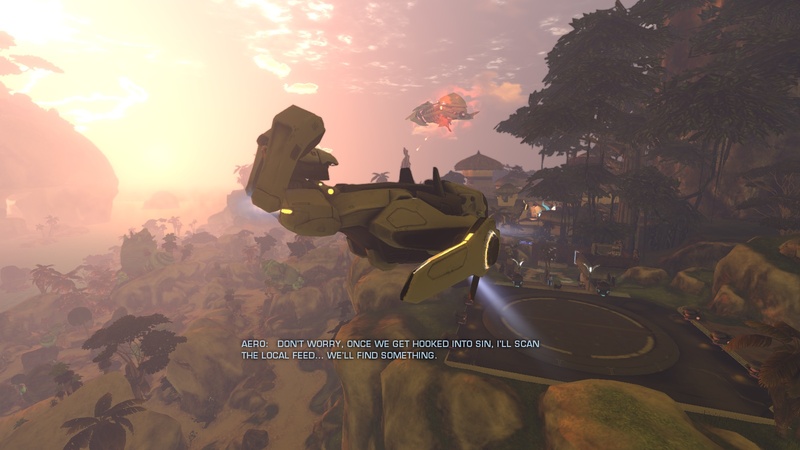 To that end, Firefall will not operate on several different shards of the same world, preventing gamers on different servers from playing together. "We don't want barriers to play with your friends," he said. "That starts with making the game free to play and it continues with making the install experience super fast. We have a lightweight installer so you can get in the game quickly and then we stream in textures and art in the background." 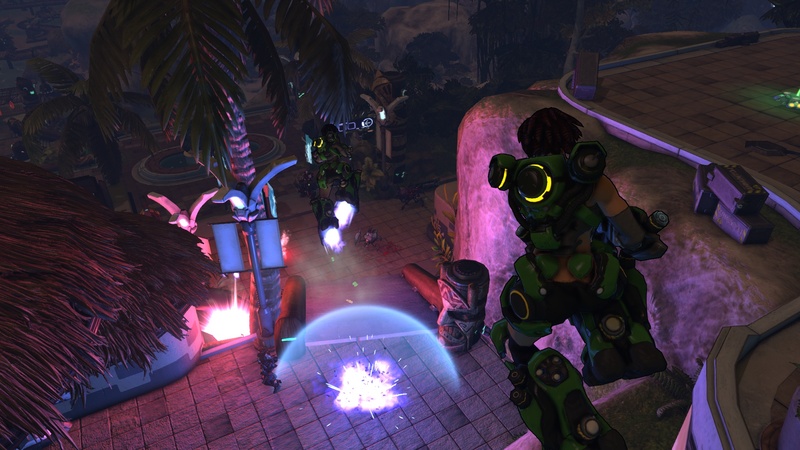 Firefall is set in a sci-fi universe, so that frees up the shooter gameplay to be full of kinetic action. Each character has a jetpack on a short burn, which adds a vertical dimension to firefights. The abilities of each class - assault, medic, recon, and engineer are currently announced - are not boring boosts to damage, but rather ways to change the battle's positioning. For example, the assault build has an afterburn ability which allows him to close distances faster even while in the air. The recon class has a neat toy called the teleport beacon. You can toss this small object on the ground and start running or even jumping off a cliff. In five seconds, when the beacon's timer is up, you will instantly teleport back to where you threw the beacon. If you pull it off, "you can actually flank the guy that's chasing you," Macauley said. In Firefall, characters will still level up just like in most MMOs but the game doesn't restrict you to a certain class. You can always switch up your class and loadouts at the battleframe stations found in settlements and most spawn points. 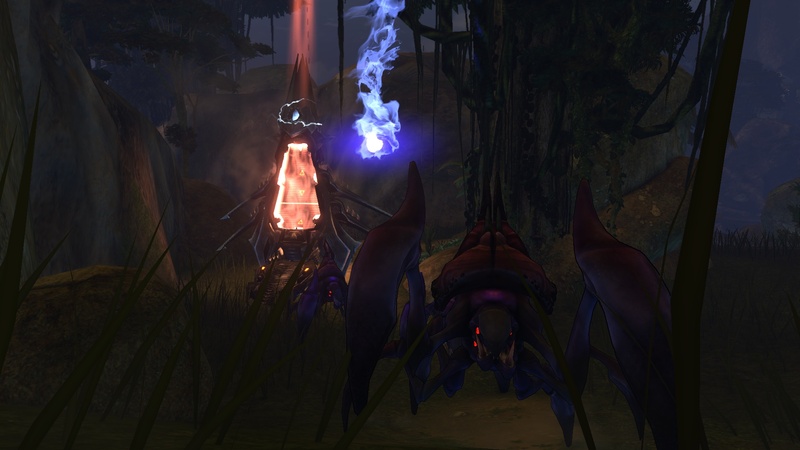 Loot works similarly in that it drops off creatures, but you can only equip new weapons and modules at forge stations. Modules provide mechanical boosts to your weapons and your backpack, the mundane name for the unlicensed nuclear reactor on your back. Scientists of 24th century Earth in which Firefall takes place have discovered a way to provide clean energy with cold fusion by using a material called crystite, making this mineral the major currency in the game. How do you get crystite? Well, it can drop off mobs in small quantities, but the real profits are in thumping. A thumper is a deployable mining machine that extracts crystite from nodes in the world. The catch is that the vibrations the thumper makes attracts all creatures in the area and in order to get a return on your investment - deploying the thumper costs crystite of course - you must defend it from attack. That mechanic makes simple resource gathering a whole subgame in itself as you'll probably want to have a few army-mates with you to beat back the alien hordes. When Macauley mentioned armies, I asked if that was what Firefall called guilds. "They are guilds plus plus. Armies have the social aspects of guilds - you can see who's online, chat with your guildmates - but you have shared stats as an army," Macauley said. "On top of that you have an army tech tree where you can collect resources as a team and spend those on unlocking things like a personal vehicle." Wait, there's vehicles? Yes, there are, but Red 5 hasn't finalized how they will work yet. Macauley couldn't divulge any more secrets on whether vehicles will function like mounts in other MMOs or be consumables like in online shooters. I suppose we'll find out more in the coming months. 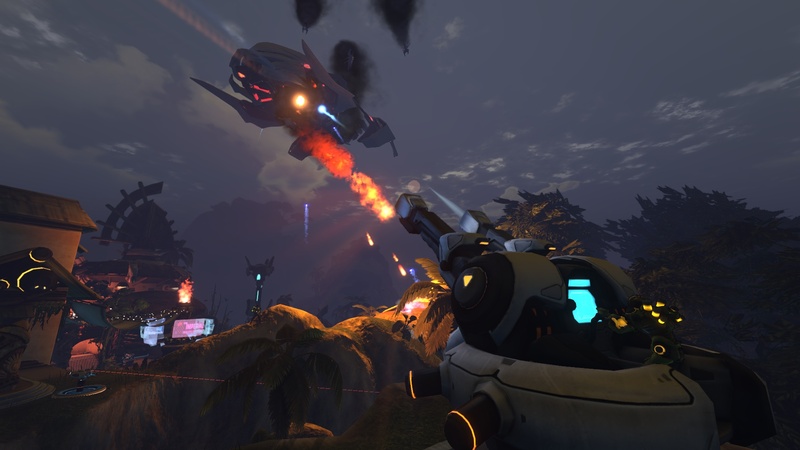 Once I got my hands on playing Firefall, all fears that it wouldn't live up to the production standards of modern games was banished. The area I spawned in was called Copacabana - Have a banana, Mr. Manilow - and it once was a beach resort town. Now, it was being invaded by a Chosen ship that rained down dropships that spawned some nasty creatures. I had the choice of participating in this random world event, or ignoring it and going about my business. Of course, if every player ignores such an invasion, the merchants, transports and NPCs in Copacabana will become unavailable until enough players fight off the invasion. I chose to fight the aliens and tried my hand at a few classes. The recon is rewarded for sniping, so I used my jetpack to get up to higher ground and rain down proximity mines using one of my abilities. I was able to take out quite a few aliens before they got the drop on me, so I switched to the assault class and blasted at them with my plasma cannon. The secondary fire of the plasma cannon sends 9 shards of energy like a shotgun blast, and that let me mow down the nasty buggers. The combat does indeed feel dynamic and vertical just Macauley said it would - I was constantly jumping and firing my jetpack to get an advantageous position. There's a lot of depth to Firefall, and I applaud the dedication to only offering purchasable items that add to convenience. "There's no way to buy an 'I Win' button," Macauley said. Instead, Red 5 will sell aesthetic items like armor colors and hairstyles, and boosts to resource gathering. The thumping mentioned earlier, for example, could gather more resources if I had paid a couple bucks, but I still have to play out defending it from attackers. I liked that even if I pay money into the game, I still will have to play it to get ahead. 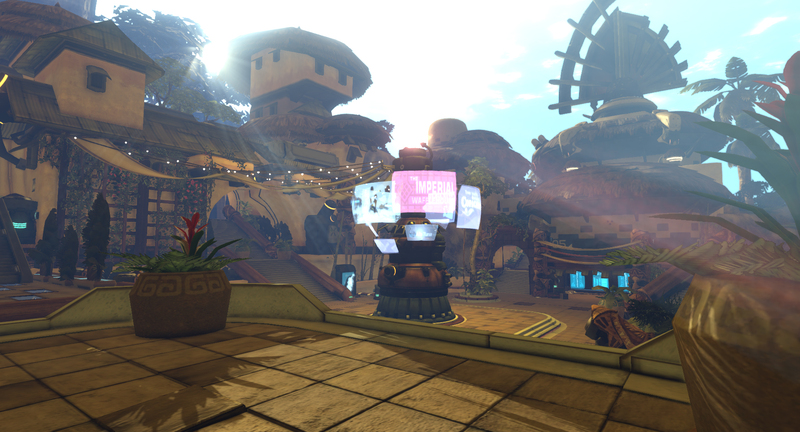 Hopefully for Red 5, other players will like it too when Firefall fully opens its doors in December.